Mill-Max is pleased to announce a new option in our receptacle line-up with the introduction of a new receptacle providing flush mount PCB assembly and bottom entry capability. The 0531-0-15-15-31-27-10-0 receptacle is a zero profile, solderless press-fit receptacle with an overall length of .068" (1,73mm). When pressed in, the 0531 sits flush with the PCB surface to achieve the lowest possible component height above board. The hexagon shaped head is designed to be press-fit into a .045" (1,14mm) ø plated through-hole. The open bottom design allows for mating pin entry from either end. The minimum mating pin length for bottom entry is .045" (1,14mm); for top entry insertion the minimum length is .054" (1,37mm). This dual entry feature allows for flexibility in component placement and assembly of boards and modules. The 0531 also provides early engagement contact, minimal overall length and accepts lead diameters from .018" - .023" (0,46 - 0,58mm). 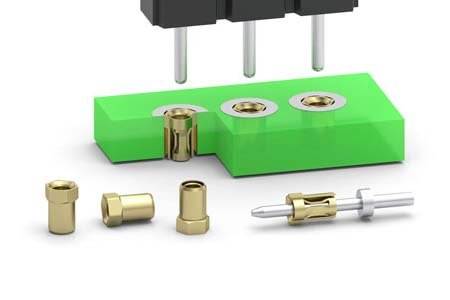 The internal contact allows for short receptacle designs due to its .062" (1,57mm) length and the fact its design does not require excess protrusion through the fingers of the contact for electrical connection. The ability to use shorter mating pins provides several advantages such as compressed packaging, shorter electrical signal paths and lower potential RF signal interference. The receptacle shell is made from brass alloy and, like all Mill-Max pins, are high-speed machined to precision tolerances. The contact is press-fit into each receptacle shell forming a gas-tight connection. It is a four finger contact, precision stamped from beryllium copper strip and heat treated to provide excellent spring and electrical properties. The receptacle current rating is 3 amps (@10ºC temp. rise in free air). The receptacle shell and contact are gold-plated providing the highest interconnect reliability, corrosion protection and wear resistance. Gold plating on the shell of the 0531 is recommended to yield the best results during the press-fitting operation.